A community-based program for K-5 students in the South Broadway neighborhood. The program is a project of United South Broadway Corporation and the Albuquerque Community School Project at the University of New Mexico. The program is FREE and is offered Monday-Thursday immediately after school until 5:45pm. The program, developed with the assistance of the University of Pennsylvania’s Center for Community Partnerships, is staffed by students in the UNM Service Corps. Call 505-243-1434 to learn more or to enroll your child. In 2003 the South Broadway community identified the need for stronger elementary and middle school reading, math and science education. Because of its deep roots and long presence in the community, USBC took up the challenge, and worked with community leaders to launch the Dorn Charter Community School. USBC brought in the expertise of the University of Pennsylvania’s Center for Community Partnerships (now the Netter Center for Community Partnerships) and the University of New Mexico Community Engagement Center. The school combines structured teaching and hands-on activities with a STEM (Science, Technology, Engineering and Mathematics) focus, to encourage and reward children’s intellectual curiosity and capitalize on learning opportunities in the urban outdoor environment, including a science-based community garden and birding project. USBC supports traditional public education – and indeed, the school is chartered by the Albuquerque Public Schools – but finds that the charter school framework is best able to support a cutting-edge curriculum in math, science and reading by engaging urban students with the natural world of their own neighborhoods. Dorn Charter Community School was awarded a 21st Century Community Learning Centers grant and a Children’s Award. 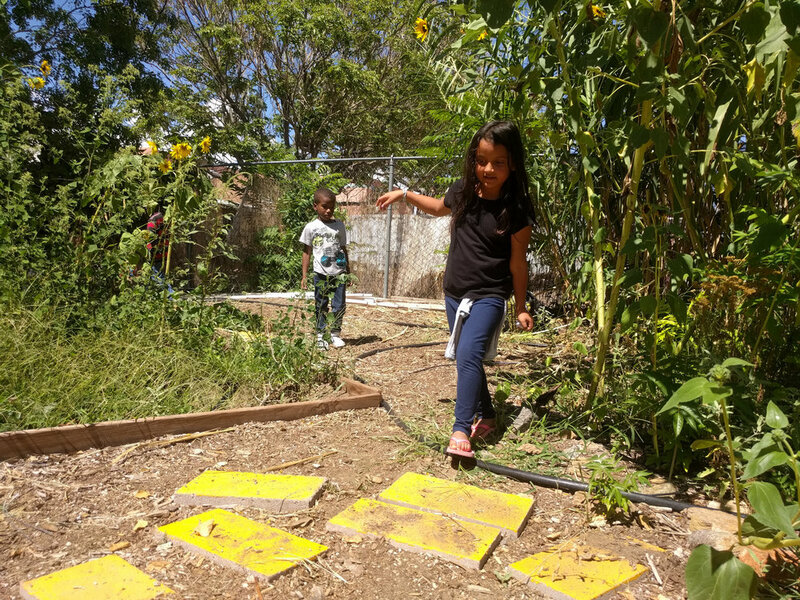 Martha’s Garden extends both the classroom and the after-school program out of doors, allowing elementary and middle-school students to enrich their reading, math and science skills. The Garden is in season year-round. Student teams develop decision-making and negotiation skills as they plan the layout of the beds using geometric principles and prepare a planting and maintenance schedule based on observation of climate and weather data that they document over time. The teams evaluate decisions such as whether to focus on high-yield crops that will bring added dollars at the market; how much space to devote to plants they like to prepare and eat, themselves; and how much productive space to yield to flowers that will attract beneficial insects and birds, and decorative plantings that will appeal to visitors. At harvest time they decide which crops to sell at a local market and which to prepare on site in daily cooking and nutrition classes. They research pricing, learn display techniques, evaluate options for investing the proceeds, and plan recipes according to which vegetables are ripe.